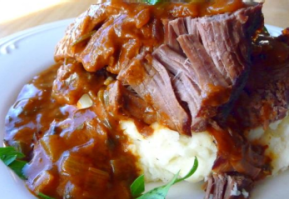 Creole Daube (pronounced “dohb”) is a New Orleans specialty that transforms an inexpensive rump roast into a wonderfully flavorful and tender meal. This tasty dish is a blending of Italian (“red”) gravy with a Cajun roux. An excellent example of the special melding of flavor, culture and cuisine that takes place in New Orleans. Step 1: Cut the rump roast into 1 inch strips. Season roast strips with salt and pepper. Brown in a large pot, coated with canola oil, on the stove. Remove the browned roast and retain the brown bits stuck to the bottom of the pot. Add the diced peppers, celery and onion to the pot and sauté until wilted. Add the garlic, stir for a few seconds then remove mixture from pot. Wash and dry the pot before beginning step 2. Step 2: Begin making your roux by preheating a thick pot using medium to low heat. Pour in the oil and add the flour gradually while stirring constantly with a spoon. Your arm will get tired, but continue to stir until your roux is the color of chocolate. Too high heat will cause the roux to speckle and burn. Use caution because the roux mixture becomes very hot and can burn like napalm. When your roux has reached the desired color, slowly pour the 2 cups of water into the roux, stirring constantly to prevent lumps. Use caution as this process creates a lot of steam. Add the diced tomatoes, tomato paste, bay leaves, basil, oregano, parsley and sugar. Slice the browned roast strips into ½ inch chunks, return to pot along with the onion, celery and pepper mixture. Salt and pepper to taste. Bring to a boil. Simmer Daube, uncovered, about an hour, add water if needed, stir occasionally. Serve over cooked pasta, white rice or mashed potatoes. Buon appetito!